Greetings, Dear Readers! For my birthday this year, I decided to do something special. Instead of simply focusing on me, I decided to do something nice for others. I read about this concept of “birthday acts of kindness” on a blog called ScaleSimple last year and couldn’t wait to try it out myself. After purchasing two bouquets of flowers and ten lottery tickets, I headed to the park. And oh what a beautiful day it was! A bit hot, but who is complaining when you live in Michigan. We’ll take what we can get 😉 My good friend agreed to meet me for the inaugural event. We set off immediately, with only an hour to spare, since she was on her lunch break from work. I immediately realized we had no plan, so I just jumped right in and started handing random people either a flower or a ticket. Often we chose flowers for ladies and lotto tickets for guys, but not always. 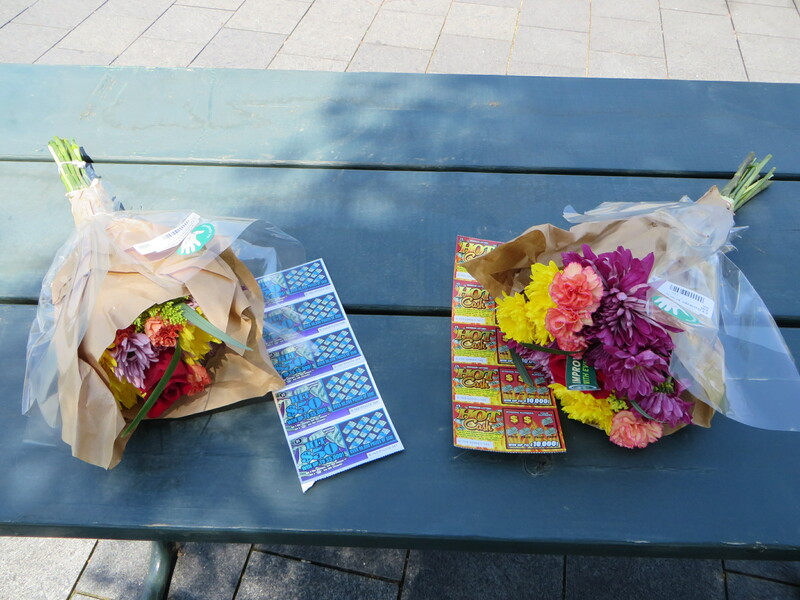 We quickly got in the groove, often telling people it was their lucky day as we handed them a ticket or wishing them a nice day with a flower. I wasn’t sure what to expect, as the blogger mentioned getting mixed responses from people. But truly, about 90% of people were very happy to receive the free gift 🙂 Only a few turned down the offer, mostly because they were in a hurry or had their hands full. One guy was actually allergic to flowers, but very apologetic. We even visited a retirement home briefly, which seemed to brighten the mood there. A mother and her young daughter accepted the flowers like a treasure. Before we knew it, we’d passed everything out, and by then, we were in such a groove that we wished we had even more to share! I’d love to do this again and extend it even further.